Under the National Blood Authority Act 2003 , the Australian Government Minister for Health is responsible for issuing policy principles, the appointment of the NBA Board and General Manager and for determining additional functions with the endorsement of the Council of Australian Governments (COAG) Health Council  (former Standing Council on Health (SCoH)). The key governing bodies in the Australian blood sector and their roles and relationships with each other are set out in the National Blood Agreement  and the NBA Act and are pictured and described below. 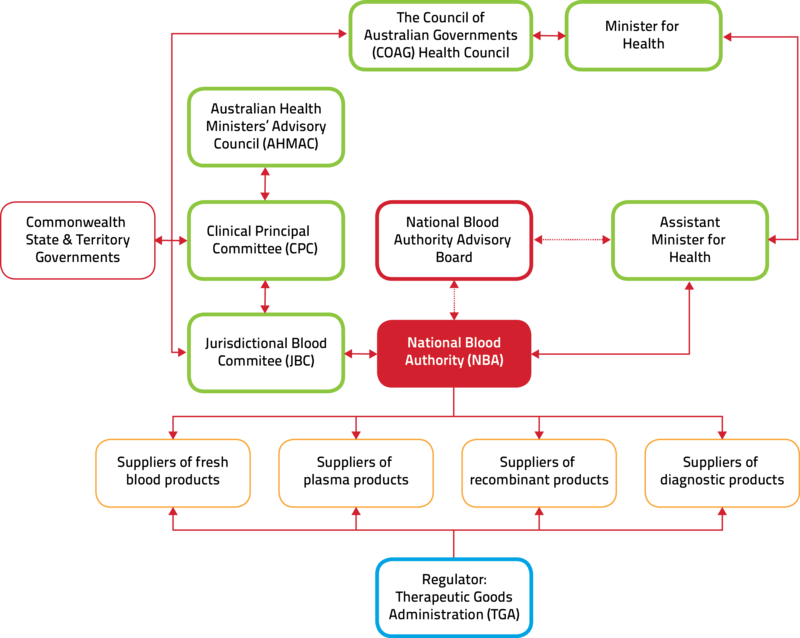 FIGURE: Governance structure of the Australian blood sector. The Australian Health Ministers’ Advisory Council (AHMAC)  provides support to the COAG Health Council. It advises the health ministers on strategic matters relating to the coordination of health services across the nation and, as necessary, with New Zealand. The Council considers blood sector matters referred to it by the Jurisdictional Blood Committee (JBC)  through the Hospitals Principal Committee, and reports as necessary to the COAG Health Council. The Council has no statutory power and decisions are reached by consensus. the appropriateness, likely impact, policy implications, effectiveness and safety of clinical and technical developments. Australian, state and territory governments are represented on the Jurisdictional Blood Committee​ (JBC), which was established by the National Blood Agreement in 2003. The JBC is the conduit between governments and the NBA. It represents the Australian, state and territory governments’ positions on blood policy, demand, supply planning and product distribution, funding and evidence-based approaches to emerging products, services and technologies. It oversees the NBA’s role in blood supply contracting. It is also the primary body responsible for providing advice and support on these matters to the COAG Health Council through the HPC and the AHMAC. For details on the current membership of JBC visit the Jurisdictional Blood Committee  page. Established under the National Blood Authority Act 2003 , the National Blood Authority (NBA) Board provides advice to the General Manager about the performance of the NBA's functions. The Board is not a decision making body and has no formal or direct role in the governance or management of the NBA. The Board does however, consider key strategic issues facing the NBA. For more information on the membership of the Board visit the National Blood Authority Board  page. issuing directives such as those relating to donor deferral. CSL Limited , which fractionates plasma from blood collected by the Blood Service and supplies a range of plasma products purchased through the NBA under the National Fractionation Agreement for Australia. Australia is reliant on an imported supply  of plasma derived Factors XI and XIII, Anti-inhibitor Coagulant Complex Concentrates, Protein C, a plasma-derived Rh(D) immunoglobulin products, Fibrinogen Concentrate and C1 Esterase Inhibitor Concentrate, which are not manufactured in Australia. A number of recombinant clotting factor products and immunoglobulin products are also imported. These products are not manufactured in Australia. Current contracts for imported plasma and recombinant products can be found here .